Boy meets coffee, boy falls in love with coffee, boy travels the world taking sourcing shots, the staging of which has not been seen since MacArthur gallantly refused to roll up his combat trousers. As the specialty coffee industry has become bigger and the world smaller, this smallness can be seen on my instagram feed with a constant stream of shots of roasters and baristas meeting those who produced their coffee (interspersed, of course, with latte art and well-plated food). I am generally reluctant to present sourcing from a first-person perspective, introducing myself into the narrative. Along with the feeling that I am trying to force people (i.e. you, dear reader) to watch my vacation slides (when you love what you do, it’s all a big vacation), I don’t know how to avoid the tendencies of adulation or patronization. Adulation in that, caught up in the travel and the emotion, along with the caffeine, there is an obvious tendency to accept as fact everything that we are told, and to aggrandize everything we see. After all, we have made a choice to partner with these growers, love their coffee, and at the end of the day, have the common goal of selling said coffee to you, no less, dear reader. On the other hand there is a tendency toward patronization, presenting oneself as either a coffee hunter or coffee savior. The coffee hunter travels the world, going to the most remote and dangerous places to source exotic and rare coffees. (I know, there was a TV show about this and yes, I thought it was awful.) But coffee is the seed of a plant, and its quality neither stems from the remoteness of its location nor the exotic head garb of its cultivators, but rather from choices of genetics, crop management, and care taken in post-harvest. Even when the Indiana Jones narrative is conscientiously minimized, telling the story of how a coffee was produced often means telling a story of poverty. And what one set of eyes sees as telling the seed to cup story, another could easily see as glamorizing poverty to provide consumers a rustic tie to the land or to bygone times, and trying to profit off of a supply chain still largely based on cheap labor from historically oppressed populations. The coffee savior is one who uses their historic position as “lord of the supply chain” to pay “more than the other guy would pay you.” But the “good” should not be defined by simply mitigating the bad, and Guy Travels the World, Applies Heat to a Seed, and Doesn’t Conscientiously Screw People Over is not really much of a story. But perhaps I am being self-righteous about not being self-righteous. Please pardon my Midwestern ways. If you are still with me, please enjoy the recounting of my trip to a community that is growing one of my favorite coffees. I tried to put words together to describe the trip, but truth be told, the slide show (or scroll show) probably does it better. This April I was finally able to visit the Tha Pye Gone community in Myanmar, producers of a coffee we have offered for the past two years. As a little background on the trip, over the past several years I have been blessed with the opportunity to contribute to the nascent Specialty Coffee industry in Myanmar by volunteering as a post-harvest consultant with the Coffee Quality Institute and Winrock International, hosting a port-to-cup tour in the US, and through our purchasing of Myanmar coffee at Little City. This opportunity has not only allowed us to bring some great coffees to Texas, but on a personal level I have made some deep friendships. For those in the Specialty Coffee industry, it may seem like Myanmar came out of nowhere to becoming a fairly well-known origin. But having peered behind the curtain a (very) wee bit, that instant success is the result of the dedication and competence of many people such as Sai Wan Ming, Su Su Aung, Steve Walls, Nimish Jhaveri, Craig Holt, Min Hlaing, Pheelay, Thu Zaw, April McGil, Anne-Claire Degal, Lisa Conway, Ko Ko Win, Khun Tu Kyi, Andrew Hetzel, Ye Myint, Marcelo Pereira, Melanie Edwards, U Khine, Sara Morrocchi, Mye Mye Aye, Moe Sat, Amy VanNocker, and so many others… and, at the end of the day, President Barack Obama, who twice visited Myanmar and led an initiative for the U.S. to invest in a nascent democracy. 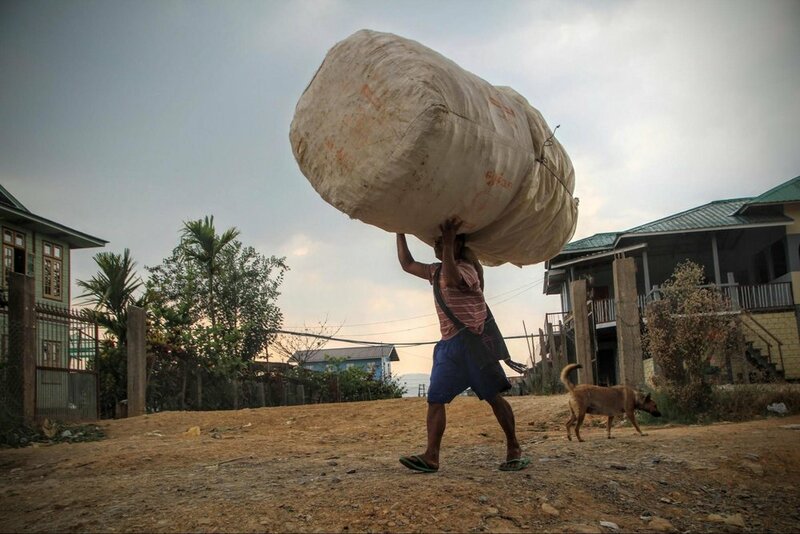 Last month I spent 2two weeks in Myanmar working at two new dry mills, Behind the Leaf and Amayar, to ensure the machines were working properly and the staff running the mills was adequately trained. While there, I was able to get away for a day to visit Tha Pye Gone, a community Little City has partnered with to exclusively offer their coffees. Tha Pye Gone is inhabited by the Pa-O people, an autonomous ethnic community. 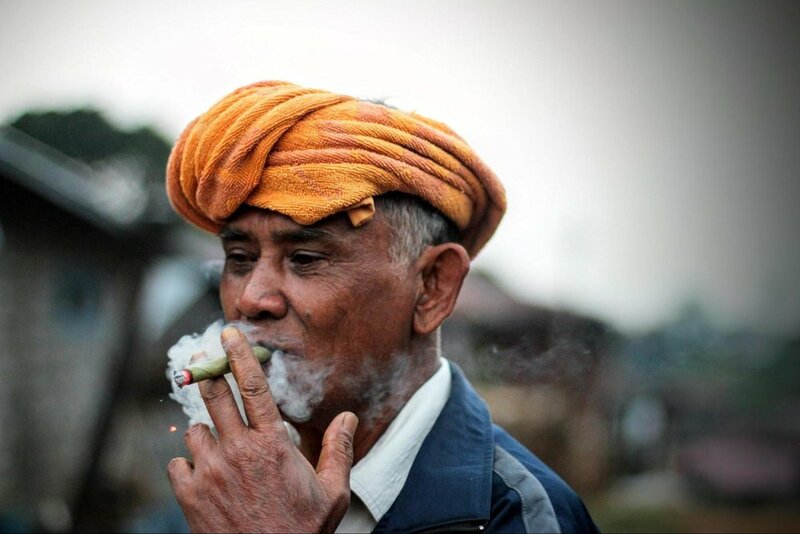 The government of Myanmar officially recognizes 135 ethnic groups. 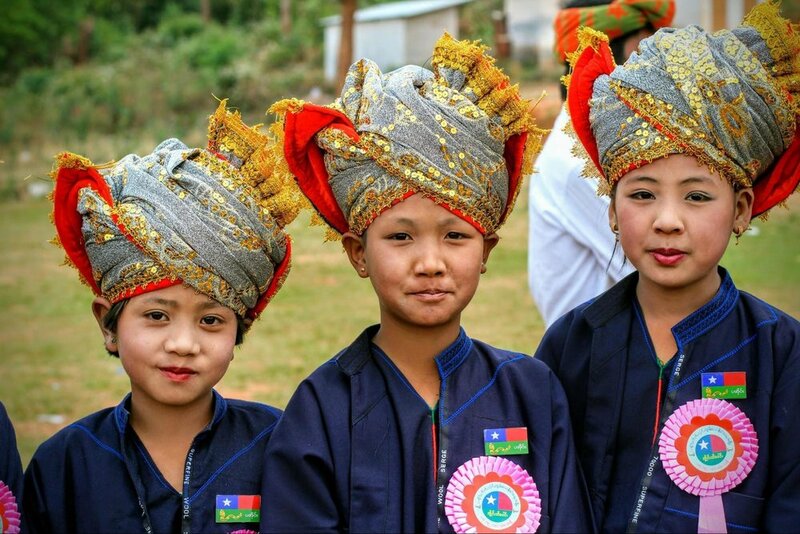 Within Shan State, the Pa-O ethnic group is the second largest, behind the Shan people. Please visit here for some background information about the Pa-O people. This partnership is through Behind the Leaf, a coffee wet mill and dry mill that was started by Melanie Edwards, an American (more specifically a North Carolinian) who has lived in Myanmar for over 15 years, dedicating her life to bettering lives in rural communities. Behind the Leaf is the coffee offshoot of Lilypad, a company that focuses on making water filters, and bricks, and training rural growers on raising rabbits. Behind the Leaf works with several local communities to produce high quality coffees. Rather than bore you with a blow-by-blow account of the trip, here is brief summary, followed by a slide (scroll) show. Tha Pye Gone is about 20 minutes off Highway 43, lying at the end of a dirt road that passes through picturesque fields of rice and garlic as it winds upward. Upon arriving, we went to the house of Zaw Zaw Tun to pick up the latest harvest. Zaw Zaw is the agricultural leader of the community, and is well-versed in coffee and avocados, two of the principal crops of the community. He works with members to ensure they are properly tending to the plants, performing the harvest, and drying the coffee. He insisted that I put on traditional clothes and we sat around the stove and spendt a few hours talking about coffee and the history of the community. Melanie, Jweet, and U Khine distributed water filters to the community, I snapped some photos, we packed up the coffee, and then headed back at sunset. I have also included some photos from a Pa-O festival I attended. So, break out the popcorn, pour yourself a cup of joe or an adult beverage (hey, no judgement here) and enjoy the beauty of Tha Pye Gone, Behind the Leaf, and the Pa-O people. Not always, but sometimes beautiful coffees come from beautiful places… (and if you are reading this, thanks Melanie. You are an example of decency, integrity, and perseverance). Sitting with Zaw Zaw Tun at his house in traditional Tha Pye Gone clothes. Jweet from Behind the Leaf delivering a water filter.